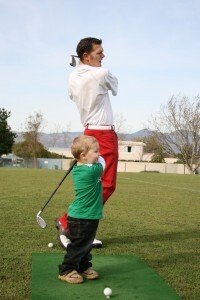 Home » Best Practices » Positive Golf : Increasing your child’s attention span… with no ritialin required! Positive Golf : Increasing your child’s attention span… with no ritialin required! One of the common questions/challenges that parents have is when to introduce the game of golf to their child… and what is the appropriate strategy. In a nutshell, there is no “one right answer”… but there are some best practices you can follow to guarantee success. First off, recognize that all children are different. And your approach on when and how to engage them will be dependent on their attention span and skill level. There is “a line” you will need to be aware of… the line constantly moves… and will require you to stay attune to the process and reactions from your child. My two children, Ally (8) and Katie (5) are completely different when it comes to their personality and when they started the game. Ally (my easy and simple child) started playing golf at a very young age… being my sidekick from birth, she grew up with a club in her hand and had a remarkable attention span. Conversely, we have Katie (whom my wife fondly refers to as “Jason in a skirt”) is my wild child who is built for speed and constantly stirring things up. As it relates to golf, Ally has been playing since she was 3… and Katie is just starting to learn the game. I took a very different approach for each of them in introducing the game… the primary variable that determined the approach was their attention span. Like all of us, sometimes we are “into it” and other times we are occupied. Keeping your expectations in check when you take your child to the golf course is key. Don’t expect them to have the focus of Tiger Woods… if you can get three 10 minute spurts from them, consider it a great day. Make it an Adventure (before you play) – Before you go to the course, make a checklist of all the fun things you will do….make it at least 50% of non-golf activities. See Adventure Blog as an example. Mix it up (while you play) – Short spurts and variety is the key. Play lots of games where you give your child points and the ability to earn a prize. You can spend 15 min on the putting green, 15 min on the driving range and 15 min in a sand trap. The more silly the games – the more fun. Take breaks and stop on a good note -Ending on a positive note is key! You want your child to love their experience at the golf course… and to ride home with a smile on their face. The last experience should be with some good high-5’s and a celebratory hugs. Enjoy the ride… these little monsters grow up extremely fast… treasure each opportunity to spend 1-1 time with your children.